Hope your week is going well. We’re still here at the beach enjoying some family time with our son and his girlfriend. The weather’s been fantastic so far…a perfect time of the year to be enjoying some sun and surf. I’m not sure why I bother to style my hair as the ocean breeze tousles it about as soon as I walk outside. I really don’t mind tho…for this gal from the mountains, the smell of the ocean and the cool breeze are most welcome. that is a lovely summer look. that knot in your skirt really inspired me! It looks like you had a wonderful vacation…..lucky! I’m going to Naples Fl. in 4 weeks so I loved seeing your beach outfits for some inspiration! Lucky you! Hope you have just as much fun as we did! Hope you have enjoyed your time at the beach. The tan lines photo is hysterical. I can especially relate to the computer programmer. True story: several years ago (back when I was a programmer) I couldn’t figure out what was wrong with my foot — how it got so dirty. Then I realized that I’d been wearing jeans and the same sandals all summer and I had funny diamond tan spots on the top of my foot. My legs & arms — as pale as can be! Oh well, at least I wasn’t wearing socks with those sandals. For being a mountain girl, you sure know how to do the beach in grand style! I’d really rather be a beach bum!! Yeah, I’d love to live here on a permanent basis! I love the outfit and the beach looks so unbelievable beautiful and relaxing. I hope you’re having a great time. I’m having a wonderfully lazy week, and couldn’t be happier! Love the beach! Love your outfit! My dog doesn’t like going near the pool 🙂 Enjoy your getaway! So relaxed and so lovely! That’s an outfit that I think very comfy in any way. Great shot and my fave is the last one. Thanks for sharing and happy weekend! I wish you a wonderful weekend as well! Oh, how relaxing, just looking at your pictures!!!! I can even feel the wind. Hey, we kinda matched this week!!!! You do the beach look very well. I need your jacket……that baby Tobi loves his mama and his daddy loves his mama too…..being such a dear and taking pictures and all. Beautiful!!! The weather’s been just super all week! Not too hot and breezy. It actually gets cool enough for a jacket in the evenings…just perfect! I’ve been catching up on my books, catching some rays and eating like a pig! You look beautiful and so does the scenery! How cool that you have found a place that you can take Tobi with you. I will have to check into more options like that…I am sure Master Bliss will be thrilled! 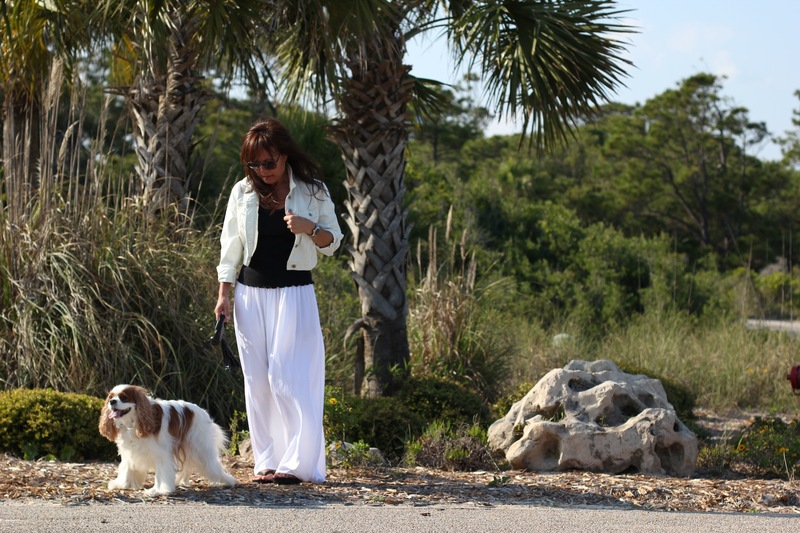 We always look for pet friendly beaches…there aren’t too many of those around tho. We love it here because Toby can come with us, and it’s so quaint! If you’re looking for a night life, this ain’t it. 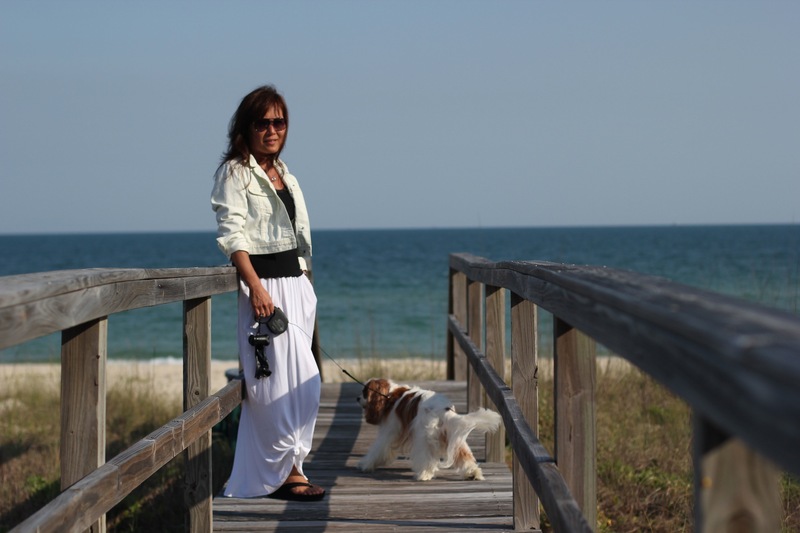 You and sweet puppy look so happy to be at the beach! And your outfit is certainly a more elegant alternative to cut-off jeans and a tank top! That outfit is wonderful! I would so wear it! Hope you are having a great time! Hi Jeannie. That nice place for your holiday. Nice outfit for the beach in the spring. I love the skirt and I love wearing the knot at the bottom in some pictures, is a fun detail. The shirt, knitted and sandals is perfect too. The new glasses are very cool. Arranged or informal, always perfect. Nothing too exciting about this outfit…just a relaxed look for the beach. Glad you liked it. I think I could live in these sandals tho.. so comfy!!! Love your beige white & black color combo. We were at the beach this weekend too and I was wearing much the same as you. Very pretty! The jacket is actually a faded light blue in color. It does look a bit beige…sorry. Enjoy that time together! You look beautiful, relaxed, and happy. you look good on the beach! so does the pup! 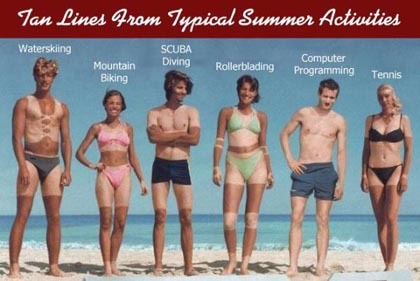 and i’ve had both the scuba diver tan AND the computer programmer tan… ugh! I wish Tobi liked the beach…he whines and panics if we get near the water. I’m gonna have to be the dog whisperer this week and try to break him! Oh- I am so jealous of the sun and the sand, what a great place to spend a little down time! You look relaxed and beautiful too! Both you and your surroundings look elegant and relaxed. I would love to be there! Haha! Yeah, that was me before this week! You look fabulous ! Great outft for Spring. Where are you? It looks gorgeous! You look so relaxed. Pretty outfit. I’m jealous. I love the ocean!